Sixto Sanchez has the makings of something special, so it's no surprise he ranks rather high on Baseball America's newly released Top 100 Prospect Rankings. Combined, the Phillies placed three prospects on the Baseball America list with Sanchez at No. 13, Alec Bohm at No. 65, and Luis Garcia at No. 88. Sanchez, 20, has electric stuff and is projected to be a top of the rotation power arm. The right-hander dealt with shoulder soreness last year and missed a chunk of the season, but he's healthy now and ready to open 2019 likely with Single-A Clearwater. 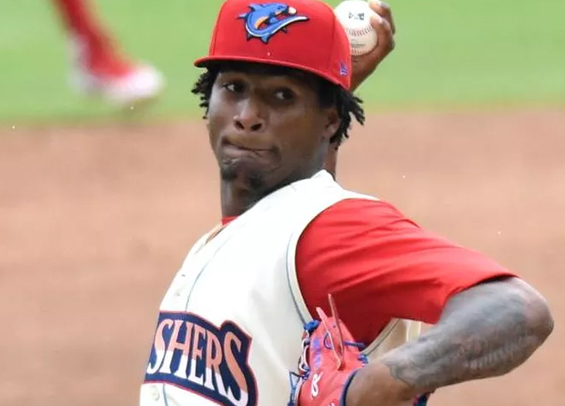 In eight starts with the Threshers last year he posted a 2.51 ERA and collected 45 strikeouts over 46 2/3 innings. Bohm, 22, projects as the third baseman of the future in Philadelphia. He's a line-drive hitter with power that'll fit well in the middle of the order. Defense, at this point, looks to be his main deficiency as he committed 10 errors and finished his first professional season with a .884 fielding percentage. Garcia, 18, is a slick defender that performed well at the plate in the Gulf Coast League last season, hitting .369 with a .921 OPS. He's a switch-hitter with speed and projects as a bat best suited for the top the lineup.